There are very many literary festivals around the world. What makes Singapore’s special? The Festival has been around since 1986, and over the years has created a solid reputation for being a multi-lingual event that celebrates the written word in Singapore’s four official languages – English, Mandarin, Malay, and Tamil. It is one of the few festivals in the world to make a concerted effort to represent so many languages. As a country nestled in a region of richly varied cultures, we’re in the unique position to offer audiences an insight into the diverse voices of South-east Asia. Why do you think authors renowned in the West are willing to come? SWF has established itself as a pinnacle literary event in the region and has always been an occasion for writers and thinkers to come together for a lively exchange of ideas and opinions. Thought-provoking discussions on universal themes like identity, culture, and shared histories are the hallmark of the Festival, so it's fitting that Singapore, this island of dreams, would be the meeting place of great minds from around the world. Talking of which, Island of Dreams is the theme this year. Why was it chosen? What does it mean? 2015 marks 50 years since Singapore became an independent nation. 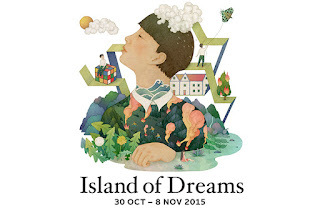 Island of Dreams coincides nicely with Singapore’s milestone jubilee year, celebrated here as SG50. It is a timely reminder for us to reflect on, celebrate, and appreciate the dreams of an aspiring nation. At the same time, dreams are universal, no matter which country you are from, or what language you speak. The Festival invites participating writers and audiences to reflect upon their dreams, hopes and aspirations. As a platform for the exchange of ideas and opinions, we hope to engage our audiences with thoughtful discussions, opening their minds to different perspectives and possibilities. Singapore presents itself as a bridge between the literature of the East, and that of the West. Why and how is Singapore a literary bridge between East and West? Our strategic position at the southern end of the Straits of Malacca makes Singapore a natural gateway to the South-east Asian region and this has often been tapped on to promote and encourage intercultural dialogue. Singapore has a long history of being a centre for translation, and for many years has seen the translation of both Western and Asian texts into regional languages. With our South-east Asian focus, we hope to continue to encourage the exchange of literature and development of these translation skills and capabilities, not just for the region, but further afield. Indonesia is the country of focus this year. Why was it chosen? Indonesia is home to hundreds of diverse ethnic and linguistic groups, and so is a culturally rich country, with a growing number of literary works produced in recent years. However, even as close neighbours, Indonesian literature is largely unknown, and as a result under-appreciated amongst Singaporean audiences. Working with The Arts House, where staff have helped curate the Indonesia programme, we wanted to unravel the long traditions of Indonesia’s writing and peek into this dynamic scene not just through the written word, but also against the backdrop of the country’s music and theatre. The co-operation with the Arts House is new development. Do you plan other alliances? Working with the right partners has always been an important part of our Festival journey, and we hope to continue to find like-minded industry partners who can bring the literary arts of the region closer to Festival-goers. It is crucial that SWF sees itself as part of a regional ecosystem and a bigger literary circuit in Asia. We have been in talks with Ubud Writers & Readers Festival, and other festivals, and are exploring regional tie-ups. The Asian festivals should work more closely together to form a viable alternative to the more established North American and European festival circuits. The most profitable Western markets are all in English speaking countries. Even when it's written in English, the literature of South-east Asia is poorly represented in those markets. Why do you think that is? It’s a combination of factors, but, for texts available in English, I would say it boils down to promotion and marketing. South-east Asian writers need to know how to market themselves overseas. Exactly, what the Singapore Writers Festival hopes to help them do. It’s not easy, but someone’s got to do it. The literature of the region that is not written in English rarely gets a look-in internationally. Why do you think that is? And what can be done about it? It’s not a question of whether the works are great or not. Unlike the huge markets in India and China, and the more established Japanese scene, the rest of Asia is an amorphous whole to Western audiences. Even within Asia, we aren’t that familiar with writers across borders. The hurdles are plenty, from linguistic diversity to market insularity. What needs to be done? We need to get our act together, and up the game. Find Haruki Murakamis in South-east Asia. Make the texts available in English. Get great translators. Break down the silos. Still, do you worry that the dominance of English should be resisted? That it homogenises disparate voices, so world literature is converging, and becoming bland? Translation all-round can only be good for everyone. If a work translated well into English raises the profile of a certain author, then that can only be a positive thing. Great translation thus plays a pivotal role in breaking down language silos and expanding readership. If not for translation, we wouldn’t have been able to read the great classics from Russia and Europe and Africa. Which is why as part of this year’s Festival we wanted to create platforms for writers from different language groups to come together to discuss textual similarities and differences. Secondly, we wanted to position the Festival as the gateway to discovering South-east Asian writers and writings, so that people could discover the rich, diverse literary traditions of the region. As a result, we are collaborating with a local literature advocacy organisation, The Select Centre, to curate a series of intercultural programmes which probe the nuances of translation, and to create opportunities for serious, engaging dialogues. Which events featuring authors from South-east Asia are you personally most looking forward to? The SWF Lecture, When Meaning Is Managed: The Fate of Literature, by Indonesian poet and man-of-letters, Goenawan Mohamad, will offer an insider’s perspective on the polarised state of writing in Indonesia, and provide insight on how writers navigate and assert their voices in this sphere where messages are being managed. Like Father, Like Son: The Music of Verse will see a family performance by renowned Malaysian writer A Samad Said alongside his son, composer-guitarist Az Samad. The session will bring together the musical and literary in a performance that draws inspiration from the West and the East. The panel, The Fluid Identities of South-east Asia, brings together travel writer Kennie Ting and research writer Elizabeth Pisani to cast light on the effect of colonialism on the region, among other factors. In advance of the Festival, what message would you send to your potential audience? The Singapore Writers Festival is for everyone, from the literati to the migrant worker, from a young child to the pioneer generation – the people who helped establish Singapore as an independent country. We want to illustrate the power of the word, and for all to experience the ceaseless possibilities it brings. Basically: listen without prejudice and be transformed! Asian Books Blog is based in Singapore. During the Writers Festival, daily posts will offer a flavour of events here in the Lion City.